When you get in your car to go somewhere, the last thing you want to see is something crawling around inside it. Unfortunately for many car owners, this is exactly the situation they find themselves in. Now ants are certainly not the worst pest you could have in your car, but that doesn’t mean they’re welcome! Just why are there ants in your car, and how can you get rid of them? Let’s examine those questions and more! Hopefully your ant problem isn’t this bad! 1 Why Are There Ants In Your Car? 1.2 Permanent Residence – Food! There is really only one reason why ants go anywhere: food! It is highly unlikely that any species of ant would actually build a nest in a car, so if there are ants in your car, there are really 2 possibly reasons why. Either they are simply scouting for food, or they have actually found some and have sent workers to bring it back to their nest. The first reason why there would be ants in your car is that they “accidentally” stumbled across it and are just checking it out, and seeing if it is a potential food source. This can happen if you parked on an ant hill, or even near a tree with a lot of ants in it. If this happens, and the ants don’t find what they are looking for, they could very well leave on their own with no intervention required from you. The other, and more unfortunate possibility is that the ants have identified your car as a viable food source, and will be sending in a steady stream of worker ants to collect the food they have found. If you have an ant problem anywhere, it is important to know exactly what you are dealing with. While it’s not crucial that you identify the ants, it can often make getting rid of them a whole lot easier, since certain extermination options work better on some species than others. You won’t want to overlook this, because simply removing the ant’s food source could prove to be rather difficult, and you may very well have to resort to some kind of chemical treatment to fully eradicate them. Accurately identifying ants can be difficult if you’ve never done it before, so you may want to consider capturing some of them to show your local pest control expert. However, if you’d like to try on your own you can find a helpful guide here that covers many of the more common species of ant. So now that we know that ants are really only after food, it would make sense that getting rid of any food in your car is the best way to get rid of them, right? Well, yes…but how do you do that? You have to keep in mind that ants are very small, and tiny morsels of food that you can’t even see can be enticing enough to keep them coming back. This means that simply picking up the old McDonalds wrappers in the back seat might not be enough to get rid of your ant problem. Here’s some simple steps to get rid of ants in your car. 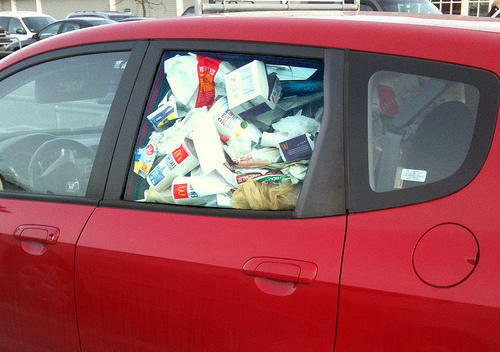 Before you even worry about food, you might want to consider simply moving your car. This may not be an option, depending on your parking situation, but if you live in a place such as an apartment complex where you have many options, consider trying it. It could work, however ants do leave chemical pheromone trails behind to let other ants know where to find the food, and unless you can move your car far enough away they might be able to easily find it again. If moving your car either doesn’t work, or isn’t a viable option, the next thing to do is to pick up anything that is obviously going to be a food source for ants. Such things include actual pieces of food (yuck! ), old wrappers, and any drinks or drink cups left in the car. 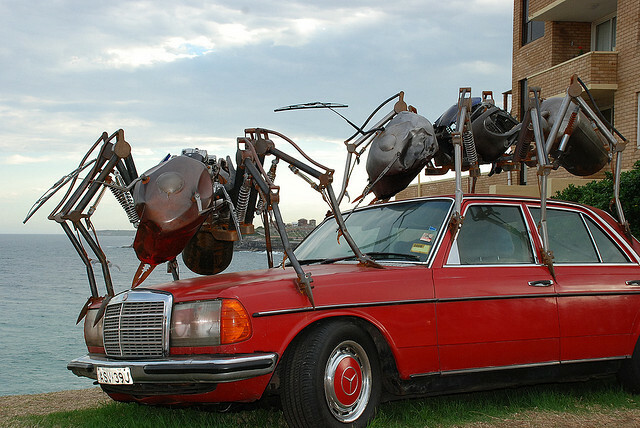 Depending on how clean the rest of your car is, and the type of ants you’re dealing with, this could be enough to deter them from coming back. If not, move on to the next step! If getting rid of the larger food items isn’t enough, it’s time to really get in there and try to clean ALL of the potential food for the ants. To do this will most likely require some vacuuming and upholstery cleaning, and you have to be thorough. Remember, ants are small and can get into nearly any crack or crevice. While you’re at it, go ahead and vacuum up any ants that you see as well! So cleaning didn’t work? Well, fear not! It’s time to pull out the big guns and get rid of those ants with chemical pesticides. The first thing you should think about treating is the tires. As the only contact point with the ground, this is how the ants must be getting in and out of your car and treating the tires with chemicals makes it impossible for the ants to avoid it. 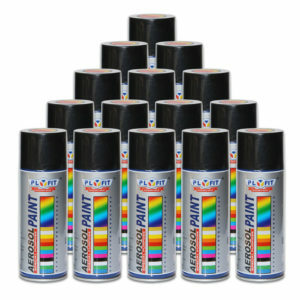 There are many commercially available ant sprays that can be used effectively for this purpose. As well at the tires, you may want to place some ant traps inside the car to deal with those pesky ants that just won’t go away. A good place for the traps is under the seats. This ensures that the ants will have no problem finding them, and yet keeps the traps out of the way of your feet, and makes the more difficult for pets and children to get a hold of. My husbands car has ants and he never has food in his car. Can you tell e a brand of helical I can put on the tires and where to get it? Thanks!! !